Starting out as a student project at DePaul University, this slippery life simulator was released as a sequel to the award-winning PC freeware game, Octodad! 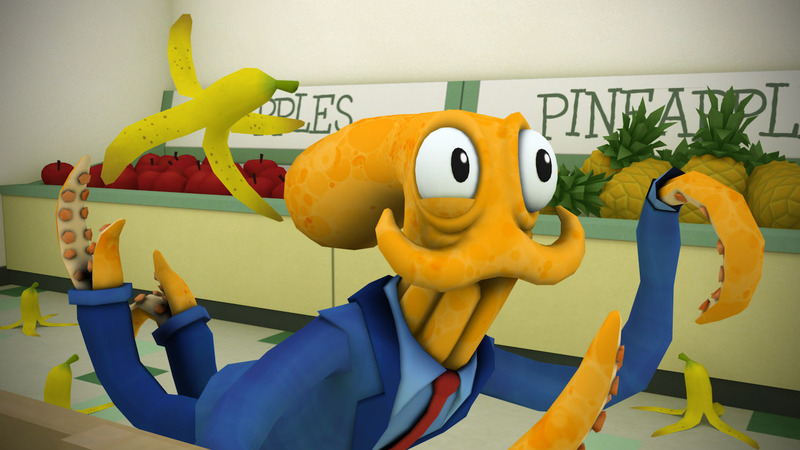 Several of the students who worked on original idea eventually went on to form their own development team called Young Horses Inc. and it was here that Octodad: Dadliest Catch was born. The title managed to eventually crawl its way onto pretty much everything across the board including the Wii U, and now the masquerading squid makes an undercover appearance on the Nintendo Switch. If I was to watch myself doing chores around the house through the eyes of my significant other, then I’m sure I will undoubtedly see the clumsy capers of Octodad: Dadliest Catch. This lovable, squishy mollusc finds himself married to a human wife in a world that would only make sense in one of those strange grown-up Japanese cartoons. You cater for your two young children, both of which get their looks from their mother and none of whom have any idea of your true identity, including, of course, your devoted wife. This leads to the moustachioed squid getting himself wrapped-up in all sorts of human endeavours, such as keeping the kids happy, doing the gardening, manning the barbeque as well as putting up with the missus constantly pecking at him over one thing or another. Thinking like a human is the easy part. Navigating as one in the form of a squid is certainly a much trickier task. You control three of your limbs independently using both analogue sticks and all four shoulder buttons. This allows you to replicate walking and grabbing items as best you can whilst blubbering about like Mr Bean on prescription pills. Octodad: Dadliest Catch heavily relies on ragdoll physics and a great deal of interaction with the environment around you. The whole ordeal is a barrel of laughs as you try to hopelessly coordinate your skills to carry out fatherly duties. The biggest gripe, however, wasn’t really the intentionally difficult controls, but the terrible camera work that follows you around. There’s no way to manually fine-tune an angle and it can make for a frustrating experience at times under the most unconventional circumstances. The plot that the mechanics revolve around is a simple but charming affair. You aim to maintain happiness within your nuclear family whilst keeping your true identity hidden away from everybody. Everything starts off swimmingly until, to your dismay, your wife decides that she wants to take the kids to an aquatic fun centre. which is basically, a zoo of sorts for fish. Of course, our hapless cephalopod begrudgingly follows suit to keep the family happy, despite the possible dangers that await him. Octodad: Dadliest Catch will probably take less than two hours to complete, which, quite honestly, definitely feels more than long enough, as the idea of it all does begin to wear thin rather quickly. There are the two downloadable content Octodad: Shorts included that reflects upon Octodad’s first date, as well as participating in a story told by the kids to extend the game a little further. This does help warrant the price tag somewhat, just don’t go in expecting it to be a game that lasts you any longer than the day that you purchase it. There are suit ties hidden to collect if you like it enough to care, but most are unlikely to even bother looking. Visually, it does the job it needs to, with its Jimmy Neutron 3D-style character design. The graphics aren’t great overall, but its style and aesthetics actually suit the game more than it would if it was more polished, as it feels more in line with other low budget YouTube favourites like Surgeon Simulator and I Am Bread. The sound design fits well within its narrative with pretty decent voice acting, especially from the kids. Octodad: Dadliest Catch is quite a hard game to actually recommend but, at the same time, it’s worth a dabble for a cheap laugh. While the original was praised for its interesting proof of concept, this rendition of trying to flesh out the idea further can feel a bit stretched. However, there is a charm to this game and its very short length ensures that it doesn’t outstay its welcome too much, and, if you want, you can always try and coordinate the lovable protagonist with a friend for some squits and giggles.